Feeling... overwhelmed. With 3 days left in March, I"m starting to feel like April is going to be an insanely busy month. Reading... I finished the four novels in The Complete Sherlock Holmes. I think I'm going to hold off on the short stories because holy moly that book is long. Time to start reading something else. I may make a trip to the library this weekend. Watching... I finished Season 2 of Scandal. Man, oh man was I hooked. I think I"m going to stay in and start watching Sherlock tonight. Anticipating... that my mama is coming to visit this weekend! She was supposed to come for the Kite Festival which was postponed to Sunday due to rain...but it looks like it's going to rain the whole weekend, so we'll see what we get up to! Wishing for... nice weather. It snowed on Monday, was absurdly cold all week and now that it's finally starting to warm up, it's supposed to rain for the next 10 days straight. UGH. Seeing in DC... Last week, I finally got around to posting my DC Bucket List. Check it out! With the rain this weekend, I might cross some things off with Mama, we'll see! Loving... that I'm running again. That despite the rain, the 10 day forecast doesn't show temperatures below 50 degrees. That Mama is coming to visit. That The Pilot has weekends off iN April again. Go do something fun this weekend. When I graduated from college in 2009, I moved to Boston. I had never been to Boston, I didn't know anyone and I moved into a one bedroom apartment by myself and learned really quickly how to be an adult. I had been a loyal subscriber to Self Magazine throughout college and maintained my subscription in Boston. When the October 2009 issue came out (I still have it! ), it launched the beginning of my healthy lifestyle and since then I've never looked back. The issue featured a healthy eating plan...it was jam packed with breakfasts, lunches, dinners, snacks and treats which taught my recent college grad self how to eat. It was a few months later when I read an article about half marathons and decided to try one. 10 half marys and 5 fulls later, the rest, as they say, is history. Women's fitness magazines get shamed a lot in the 'healthy living' world, but I've kept reading...if for no other reason than that whoever develops the recipes for Self is awesome and I have a box full of magazines dating back 5 years that I diligently browse through every Sunday night to plan my weekly meals. I even have both of their cookbooks which are oil stained, flour spattered and very well worn. 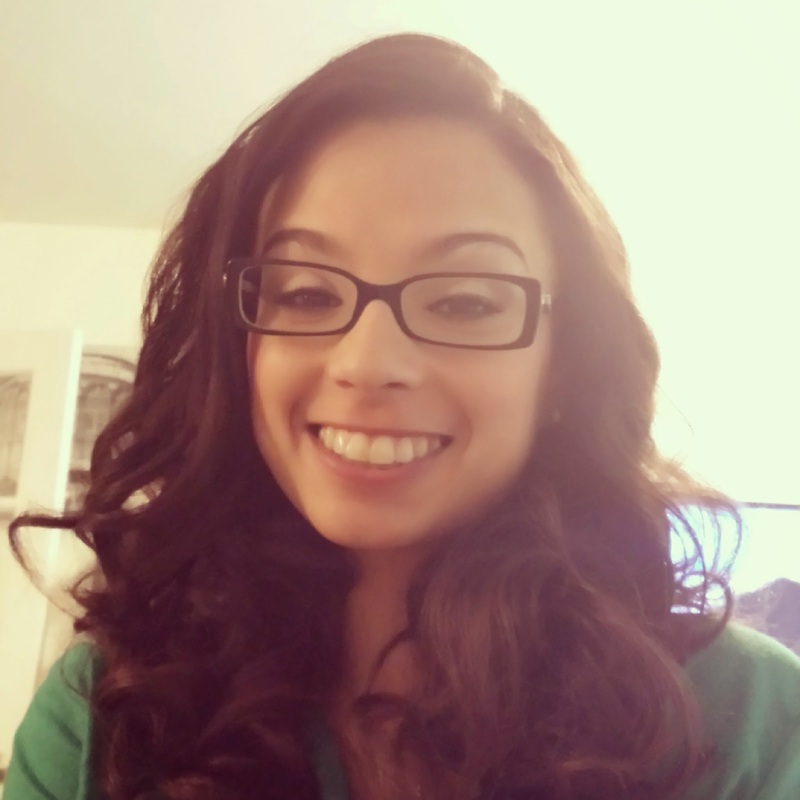 I don't read fitness magazines for advice on getting a bikini body, I read them for the healthy tips they offer, their two cents on the latest workout trends, and for inspiration on cute workout outfits. With this video to follow. Not only did the magazine totally mislead her when they reached out to her but this woman has BRAIN CANCER and was running for Girls on the Run...a group that promotes confidence in girls through running. WHAT?! 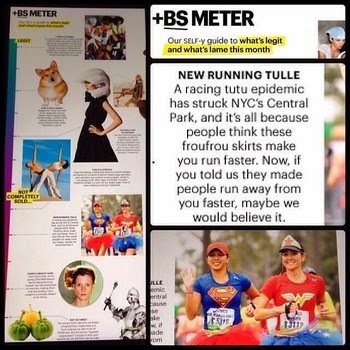 I don't wear tutus when I run but maybe I should. 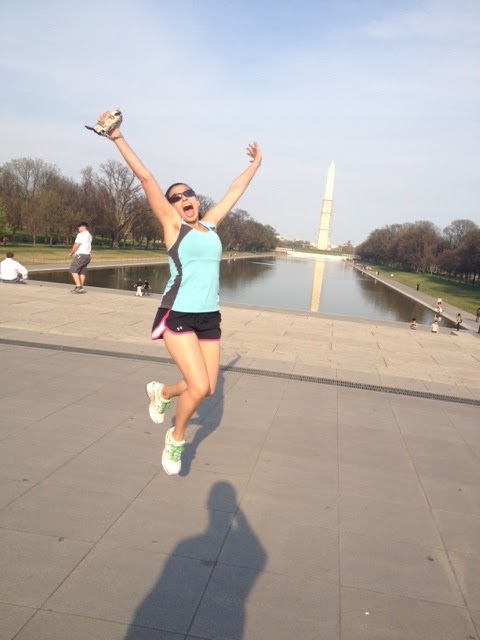 When I ran the Marine Corps Marathon, I wore black leggings and a black top. I ran 26.2 miles without ever once seeing or being spotted by my family and friends. That SUCKED. THAT IS WHY PEOPLE WHERE TUTUS WHEN THEY RUN. So that they can be NOTICED in a crowd of 30,000+ people NOT because the think it makes them faster. If you can run a marathon, I don't care WHAT you're wearing. This woman is awesome. The running community which I have come to know and love and be part of and respect is AMAZING. For a magazine that is supposed to support healthy life choices to publicly ridicule a woman for her own healthy life choice is APPALLING especially given that she is running for charity while battling her own illness. I'm honestly mortified about this. Last night, I came home to a notice that my subscription is up for renewal. I won't be renewing my subscription to Self. I've learned what I needed to from them and can honestly thank them for inspiring my own healthy journey, but it seems that they've decided to move away from that...instead turning to snark to ridicule the very model of a woman their magazine should support. Monika Allen should be on the cover of Self Magazine. Her story is a hell of a lot more inspiring than Beyonce's or some of the other celebrities they've featured on their cover. So, Self, it's been real. I know for certain that I'm not the only one who is unsubscribing from your magazine. This? What you did here? This is bullying and I don't support that...especially not when it's targeted toward someone as awesome as Monika. Do you read fitness magazines? Last night, I ran 5 miles. Admittedly, I kind of put this run off. I was planning to run them on Saturday. Friday, after work, I went for a spin class…one of the toughest spin classes I've ever done…and chased it with a 3 mile run on the Mount Vernon Trail. Cut to Saturday morning when I was tremendously sore (and slightly hungover) and I knew that despite the warm temperatures that would hit DC later that day, I needed to call it a rest day. Sunday got ahead of me and here I was Monday with 5 miles that I still needed to swallow. It didn't feel great, but it didn't feel bad. I wore a new pair of shoes (which my PT told me this morning that I shouldn't actually be doing until I’m 100% comfortable running again) and felt some twinges along the way, but I focused on my form and I made it. I got home and stretched. This morning, I went to PT and I’m feeling pretty good. I’m still worried about my knee. After all, it was at Mile 12 of an 18 mile run when my knee gave out and I decided not to run Marine Corps. I still ran for almost 6 weeks after that…pain free up to about 8 miles too, so I keep telling myself…when I can run 5 miles…or 6 miles…or 8 miles…I’ll be ok. But really, I’m fine. I was discharged from PT this morning. I’ve been working hard at getting better and I’m pretty confident that I’ll be able to successfully train for the Nike Women’s Half. I’m not running Cherry Blossom though. This will be the third time that something is preventing me from running Cherry Blossom. I think I’m giving up after this. I just don’t think it’s smart to try and jump from 5 miles to 10 miles in two weeks without risking injury again. So, what is my plan moving forward? Nike Women’s is April 27th. I’m pretty sure I can be ready for that. It won’t be my fastest half, that’s for sure, but my goal is to train successfully and finish. After that? There’s a Half the last weekend in May that I’m hoping The Pilot and I can run together, but that all depends on whether he gets that weekend off. I wanted to make my way to Eugene to run the Eugene Marathon this summer, but I’ve decided against. It. I don’t think I’m in shape to start training for a marathon right now (I still don’t feel 100% in my runs and I’m really slow), so I’m going to take the summer to work on getting my distance and speed up. Right now, I’m on the fence between the Richmond and Philly Marathons in November. I’m leaning toward Richmond because when I ran it last, it was 65 degrees at the Finish and absolutely perfect…but I don’t know if that was a fluke. I absolutely loved the Philly Marathon (my first) and would love to revisit it as my first marathon in 2 years (ugh that hurts) and my 5th attempt at a sub-4 race, but I hate running in the cold. So, 2014 is going to be a slow running year. It may not be my year to go sub-4 but right now, I’m just focusing on running strong again and one day, one day I will take 1 minute and 6 seconds off my marathon time to finally get that sub-4 beast off my back. 2. This weekend was busy but it was also a lot of fun. Friday after work, I went to a spin class with Megan and then met The Pilot for a 3 mile run with the puppy. Post-workout, we went out for drinks with some friends and went to bed way too late. Love. 3. I didn't run after Friday because my legs were dead all weekend. Not painful, just super sore. Don't Love. 4. 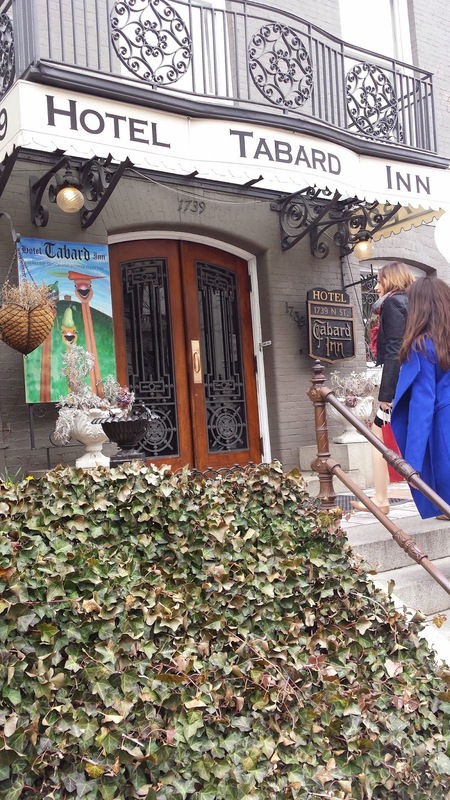 Saturday, I met up with some friends for brunch at The Tabard Inn. The weather was a giant tease and I spent the day outside, reading and enjoying the day before The Pilot and I went to church and then I stayed in and baked all night. Love. LOVE this place and will definitely be back. 5. Apparently, it is baseball season...which is bullsh*t. Baseball season starts in April. This whole playing a game in Australia and having it count is not ok in my book. Don't Love. 6. Sunday morning, The Pilot and I headed to Whole Foods to meet up with Allison. She spent an hour with us walking us through the store and helping us find healthy, filling meal ideas for when he's on the road. It was awesome and so unbelievably informative. It's a struggle for him to eat on the road and I'm so excited to put into place everything Allison helped us with! Love. 7. Sunday, I also got my wedding hair/makeup trial done! I'm so so so happy with how it came out! I'm wearing it all up but this is just a sneak shot of what it looked like when I took it all done last night. Love. 8. I didn't sleep last night. Again. This is 3 months now that I'm going on 3-4 nights a week of not falling asleep at all. Time to call the doctor. Don't Love. 9. My mom is coming to visit this weekend for the Kite Festival! So far, it's my favorite thing I've done/seen in DC and I'm just hoping the weather cooperates this year! Love. That's what's going on on my end! Feeling... Excited! It's SPRING! It's SPRING! It's SPRING!!! It's officially the first day of SPRING! It's going to be 60 degrees today and I'm so pumped to take a nice long walk at lunch time and then *maybe* hit the trail for a light run later (I'm kind of sore so we'll see). This was almost one year ago. I plan to recreate this photo in approximately 2 weeks. There may again be snow in the forecast but a balmy first day of spring is just what I need to kick off the season! Watching... Scandal. I'm almost finished with Season 2. Then, I'm going to start binge watching Sherlock Holmes. Hopefully with less binge involved as with the start of spring, I plan to spend most of my time out of the office, outside. Anticipating... The Cherry Blossom Festival! There are so many things going on in DC over the next three weeks and I want to go to all of them! Wishing for... Warm weather that's here to stay. I would like to burn my winter coat please and thank you. Seeing in DC... It's going to be gorgeous out this weekend and The Pilot will be home. Adventures will ensue. Loving... that I'm up to 4 miles of pain-free running. Heading out for 5 this weekend! Fingers crossed it goes well! Last night, after work, I went to my favorite yoga class with my favorite instructor and zen-d out. It was perfection. I stretched my hamstrings and opened my hips and just felt so good. Afterwards, I chatted with Meaghan who had joined me for the class and headed home. I took Peyton for a nice long walk and called my sister. Then, I checked my email and got seriously worked up over a stupid email. I was so upset that instead of making the nice, healthy dinner I planned, I boiled pasta which I'm so so so sick of doing. I ate it in about 3 minutes and then sat on the couch and watched two episodes of Scandal, went to bed way too late and didn't sleep at all. So I'm making a new rule. No PM email. No PM social media. I sit in front of a computer at work all day on email. I have a smart phone. I don't need to open every single email I read within 5 minutes of receiving it. It's ok to let it sit and linger for a bit. I've always been so good at unplugging. Every time I've ever gone overseas, the lack of international capabilities on my phones have always forced me to unplug and I've loved it. Last year, I never took a vacation, which means that last year, I never unplugged. But lately, I feel glued to my phone. I get home from work and keep my phone at my side while watching TV. It's already been six months since I left the job that brought me to DC...which means, it's been six months since I've had to keep my work email on my phone and check it constantly...which means that I don't need to keep my phone at my side anymore. The Pilot and I have been itching to get a weekend away for the last month and I'm really hoping we can make it happen in April. I'm also hoping that with the coming of spring and the increasing of my weekly mileage, I'll get some more time outdoors and off my computer/phone. This winter seems to have been unbearably difficult on everyone, myself included. The fact that there is yet again snow in the 10 day forecast makes it impossible to be optimistic that spring will ever arrive. But, one day, it will and then it will be glorious and I'll spend my days riding Bikeshare bikes, running up and down the Mount Vernon Trail and the National Mall, and lounging poolside, and all will be well. So, no PM email. Get outside. Drink water. UNPLUG. That's my plan moving forward. Since the summer rolled around (yes, last summer), I've majorly fallen off the bandwagon with meal planning and preparation for the week. I got bored of my typical go-to recipes and tired of trying out recipes online that I didn't like, so I just kind of stopped for awhile. I had seen a lot of ads online and heard from a lot of friends that have had a lot of success with dinner kit delivery programs, so I decided to give one a try after my friend Robyn sent me a code to try Blue Apron Meals for free. How It Works: Blue Apron picks out meals that satisfy your food preferences (land, meat or veggie) and sends you a box each with all of the ingredients, along with recipe cards. Each box is meant to make 3 meals for 2 people and costs $59.99. Given my weekly grocery budget, I thought this was a great way to get 3 meals in and still stay within budget, while also trying out some foods I normally might not try and getting a taste for different things. My first delivery was scheduled to arrive on Thursday. I ordered the veggie plan. I was really excited about the planned meals I had for the weekend and looked forward to my delivery which was scheduled to arrive between 8am and 8pm on Thursday. I got home from work Thursday around 6. My delivery hadn't arrived yet, so I headed out for a quick run. I was planning to start on the Braised Carrots when I got home, but since my delivery hadn't arrived post-run, I just whipped up some pasta and planned to start whipping up my Blue Apron meals on Friday. At 9:30, there was still no delivery, so I took to Twitter. I didn't expect a response that night, so sent an email, hoping I would get a response the next morning. I didn't actually get a response until 2pm. I apologize again. This was an unforeseen issue and we are handling it the best we can. Unfortunately, we cannot send you another box for this week. Let me know if you have any other questions or concerns. And again, I truly apologize for the inconvenience. So, let me get this straight. I ordered something to be delivered. Somehow, it got lost (which, I don't understand at all...how does one lose groceries?) and instead of delivering the next day, they just cancel it out right and tell me that I can't get a box at all? This was enormously inconvenient, especially since I had planned my weekly meals around getting a delivery on Thursday. I was told that I would not be charged and that I could take $10 off my next delivery. Problem is, this was supposed to be a free trial, so now, I lost my free trial, never got a delivery and all you want to do is offer me $10 off a service that I can't rely on to actually show up? No thanks. I was tremendously disappointed with Blue Apron. Not only for flat out not delivering my food, but for their response. I should have gotten a phone call or an email first thing Friday morning, apologizing for the inconvenience and letting me know that my order would be delivered that day. I should not have had to chase them through Twitter and Facebook with no word or explanation for most of the day. It's obvious that I wouldn't recommend Blue Apron. If trying out a dinner kit is something you're interested in, I know that Plated and ChefDay both do the same thing, so I"ll be looking to try one (or both) of them out soon. Have you ever tried a delivery dinner kit? What did you think? Any recommendations? 2. It's March 17. Two days ago, it was 68 degrees. Today, there are 4 inches of snow on the ground. Don't Love. 3. Seriously though, if it has to snow 3 days before the official start of spring, at least I got a day off out of it. Love. 4. The Pilot got a Snow Day too! Love. 5. This weekend was pretty low key. I still wasn't feeling great, so I laid low. 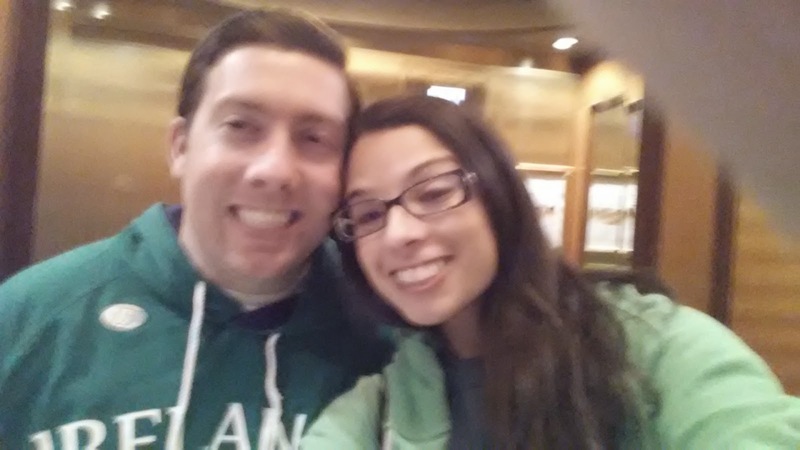 Leanna had a St. Patrick's Day Party that The Pilot and I headed out to and other than that, we didn't do too much. Love. 6. My wedding shoes came in on Friday and they're perfect. I may have cried. I got insanely excited. Probably because I never had that "I found the dress" moment...so this was the next best thing. I will probably fall apart when Mama finishes my dress. Love. They're Kate Spade and I <3 them. 7. 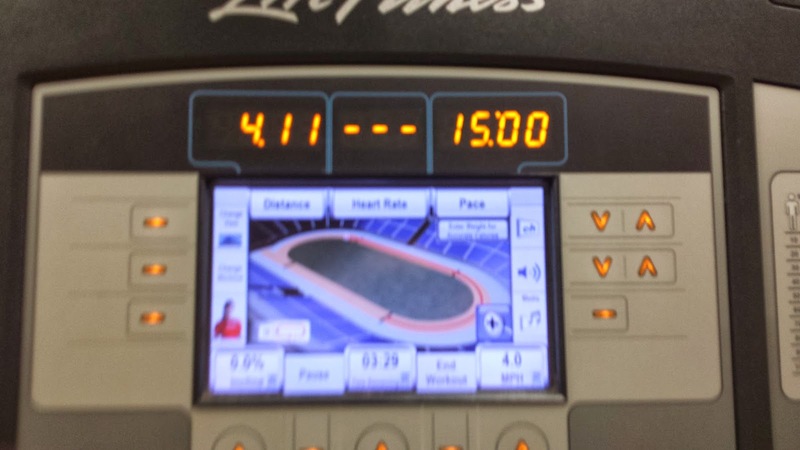 This morning, I ran 4 miles. My longest post-injury run yet. It was awesome. Love. I don't run in the snow. I don't need to re-injure myself, thanks. No, I wasn't running at a 15:00 pace. This was my cool down. 8. While on the treadmill, I was thinking about how badly I want to go to a spin class this week. Lo and behold, Sweetgreen announced a free spin class at Revolve this Friday. Sign up here and join me, Megan and Logan if you're interested! Love. So that's that. This week will be filled with workouts, good meals, more binge watching of Scandal, warmer weather (because seriously, spring is drink) and new adventures. I'm pretty stoked about it. 6 months from now, I'll be walking down the aisle. We're getting married in SIX MONTHS! It's finally starting to feel real! Since the moment we got engaged, everyone has told us to just enjoy it because it flies by...and I haven't felt like that at all! Seriously, I asked The Pilot a few weeks ago if we could move our wedding up to June. I still don't feel like time is flying by, but it's finally, finally starting to feel close. So, here's what's on our plate at the 6 month mark. This weekend, The Pilot and I have Step 6 of our Pre-Cana process. I wish I was joking. I've really enjoyed the Pre-Cana program, but communicating with our church has been virtually impossible. Step 6 is a seminar taught by the priest who is marrying us. After that, we have one other meeting with him, and then just a lot of paperwork and we'll be all set. It's funny, while I've found planning our wedding to be relatively easy, I've found myself stressing about the things that I thought would be the least of our concerns. The church is one of them. It's absolutely impossible to get any questions answered by anyone at our parish. I've been trying to figure out if we will have to pay a fee or donation to use the church for 4 months now...still haven't been able to get an answer...from anyone! That's just one example. Another headache? Hair and makeup. I never thought it would be so difficult to find someone to do my hair for our wedding. I'm the only one getting my hair done for that day and I couldn't find anyone who would come do my hair unless we had a minimum of three or four people getting services, or some ridiculous minimum amount like $700. What? What about people with small bridal parties? On top of that, it's just absurd what they cost. $250 to put bobby pins in my hair? Seriously? I finally found someone who has great reviews on Wedding Wire and is reasonably priced in comparison with everyone else, and doesn't require a minimum of any kind. I have a trial scheduled for next weekend, so we'll see how that goes! I figured out what we're doing! Let's just say there's going to be a lot of DIY and I'm probably going to take a trip to Texas to assembly line the heck out of our centerpieces with my sisters, sister-in-law, brother and step mom so we can knock it all out. Hear that Dad? The best part? 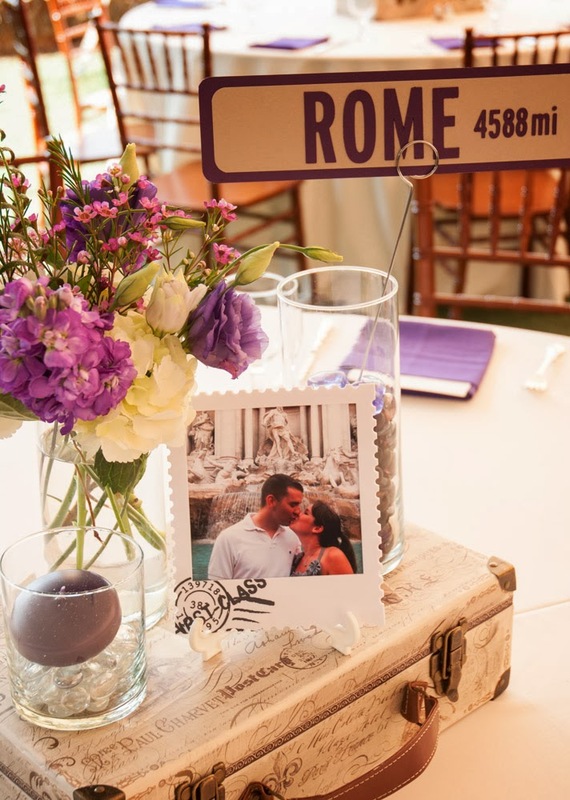 We're keeping our centerpieces way under the budget I had planned for them which is awesome! Here's some inspiration for what we're trying to do. This week, I ordered a fabulous dress from ModCloth for our Rehearsal. I hope it fits ok because it was one of those OMG I HAVE TO HAVE THIS finds and I don't want to have to wait until September to wear it. 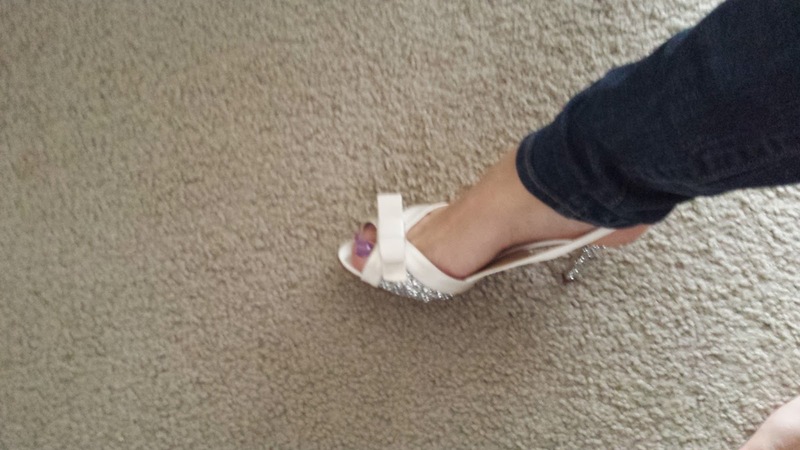 I also ordered my wedding shoes! They're from Kate Spade and I had every intention of spending over $300 on them, but when I found out they were sold out online, I managed to order them from an outlet at $200 off. WIN! Again, I just hope they fit right! The Pilot and I agreed that we don't want a traditional rehearsal dinner. We want to have a welcome party and just tell everyone who's already in to stop by and say hello. We found a place that's right near our hotel that just opened up two weeks ago that would be perfect. We're working with them to get the details sorted out and I really hope it works out! So, that's that. I'm hoping to have these everything we haven't figured out all sorted by the end of this month. We'll see! Once those details are taken care of, then we'll be able to sit back and relax! I'm getting so excited!! Feeling... Lousy. I've been bedridden with a sinus infection for the last 4 days. I tried going into work this morning and had to leave at lunch time because I felt so sick. I'm hopped up on antibiotics and hoping I start to feel better by tomorrow because I haven't been this sick since I caught pneumonia 5 years ago. Reading... Still reading Sherlock Holmes. I like it, but being sick and having all of this sinus pressure, I haven't really felt up to reading much this week. Drinking... not nearly enough water as I should be. Watching... Scandal. Being cooped up on the couch all week means binge watching Netflix. I plowed my way through Season 1 and started on Season 2 when I got home today. It took a few episodes to get into it, but now I'm hooked. Anticipating... the delivery of a gorgeous ModCloth dress I bought which I think will be perfect for our rehearsal night. Do you shop ModCloth? I'm obsessed. Wishing for... a good run. Being sick, I've had to put my return to running on hiatus and I'm eager to get back to it. Loving... The Pilot's weekends off. Since starting his career as a commercial airline pilot, it's extremely rare for him to have weekends off. This month, he has 4 of the 5 weekends off, and it's been great having him around to go out with friends, shop for registry gifts, and enjoy the gorgeous weekends we've had over the last two weeks. Time to get back to resting up, binge watching Scandal and drinking lots of tea. Any home remedies for getting better quickly? Ugh...I'm sorry that this is a week late. From Good Reads: "I was born twice: first, as a baby girl, on a remarkably smogless Detroit day of January 1960; and then again, as a teenage boy, in an emergency room near Petoskey, Michigan, in August of 1974. . . My birth certificate lists my name as Calliope Helen Stephanides. My most recent driver's license...records my first name simply as Cal." My Thoughts: I wanted to like this book, I really did. I had a lot of not nice things thrown my way at the mere mention of struggling through it but guess what, I didn't like it. It was, at times, a wonderful page turner, and at others, mind numbingly boring. The story was told from the first person omniscient...which didn't work for me. It would have been better had it been broken up and told by different narrators. I don't have much to say about this book really, I just didn't love it. I found it to be anticlimactic. You know from Page 1 that Callie is a hermaphrodite who later becomes Cal. The build up to that happening spans the course of 3 generations of family history until, it just kind of happens. She learns about her condition and chooses to live her life as a boy, there wasn't really much to it. I thought the book was well written, but I just had a hard time with it. 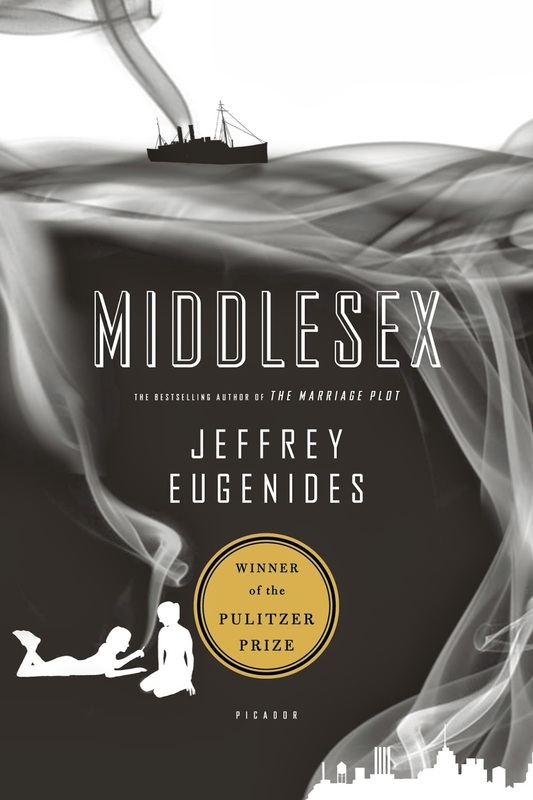 Have you read Middlesex? What did you think? Feeling... Grumpy. I don't know why but since last night, I have been in a terrible mood. I fasted yesterday for Ash Wednesday and I think that might be why. Reading... The Complete Sherlock Holmes by Arthur Conan Doyle. I picked this up for free on Amazon for my Kindle and decided to dive in. 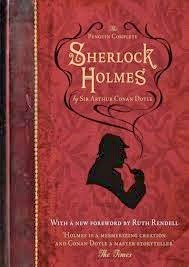 I've always been fascinated by Sherlock Holmes stories and the books are great. They aren't as mysterious as I thought they might be...mostly because it's Holmes' nature to figure things out in the most far-fetched ways that it makes it impossible to guess, but I'm still enjoying the read. Also, I know I never posted my Middlesex review. I'm working on it. Sorry! Watching... Well, Downton Abbey is over but everything that went on hiatus for the Olympics is back so...Parenthood, New Girl and most recently, Growing Up Fisher. Anticipating... Getting the last of the wedding things that need to be booked booked this month. Wishing For... A vacation. It has been way too long. Seeing in DC... Snow and lots of it. I'm hoping the weather starts getting warm again so I have the motivation to explore a bit more! Loving... Running again, the 10 day weather forecast. 3 days next week are supposed to be above 60. You guys, I think we might actually see spring soon. Also, Daylight Saving is on Sunday. No more getting home from work when it's already dark out. I'm so ready for the weekend. 1. SNOWWWW DAYYYYYY!!!!! Yesterday was a Snow Day and I needed it. I was so burnt out from my trip this weekend that I was contemplating calling out on Monday, so this was a major win. Love. I wonder if this movie is on Netflix? Just kidding...this movie was terrible. Even my 7th grade self thought so. 2. The Snow Day brought me a 4 day weekend, which I desperately needed, especially going into the dead zone of March and April which are holiday free. Love. Especially when she finds sticks buried in it. 3. I didn't get in all of my workouts last week, more because of time than anything, and looking at my training plan, I'm a little nervous about being ready for Cherry Blossom. Don't Love. 4. Running is going well. I still don't feel 100% but I'm not having any pain when I'm running. I ran my longest post-injury run yesterday, 3 miles, and spent the afternoon icing, stretching and rocking my compression socks and I feel good today, so that's promising. Love. 5. The Pilot and I made a trip to Jersey this weekend. We were planning to fly out on Thursday but our flight got cancelled and we ended up driving. It was a busy, busy weekend but we spent a lot of time with our families and I got to see what my mom has done with my wedding dress, which was really exciting! Love. 6. I've been taking Melatonin for the last week or so to help with the fact that I haven't been sleeping. It's been working great, but the downside is that I wake up and I'm exhausted. I just can't win. Don't Love. 7. The Pilot and I went out on Sunday and bought the main pieces for our centerpieces! They ended up costing me $300 less than what I had originally thought they would cost, which is awesome. Our centerpieces will be DIY but they won't require too much work, which is great. Love. What did you get up to this weekend? Did you have a snow day?